Submitted by Taps Coogan on the 10th of August 2018 to The Sounding Line. The following map, from Twitter user NaytaData, shows the primary cause of population growth or shrinkage in nearly every region of Europe between 2012 and 2016. Keep in mind that the map designates the primary factor leading to population changes, not the only factor. There is not a single region within Norway, Sweden, Finland, Estonia, Latvia, Lithuania, Denmark, Belgium, Germany, Austria, Switzerland, Italy, Croatia, Hungary, Romania, Bulgaria, or Portugal where the population is growing primary as a result of births. Conversely, in every region of the aforementioned countries where the population is growing, it is primarily the result of migration. This migration includes both international migration and domestic migration. Domestic migration occurs when people leave one part of a country for another part of the same country. 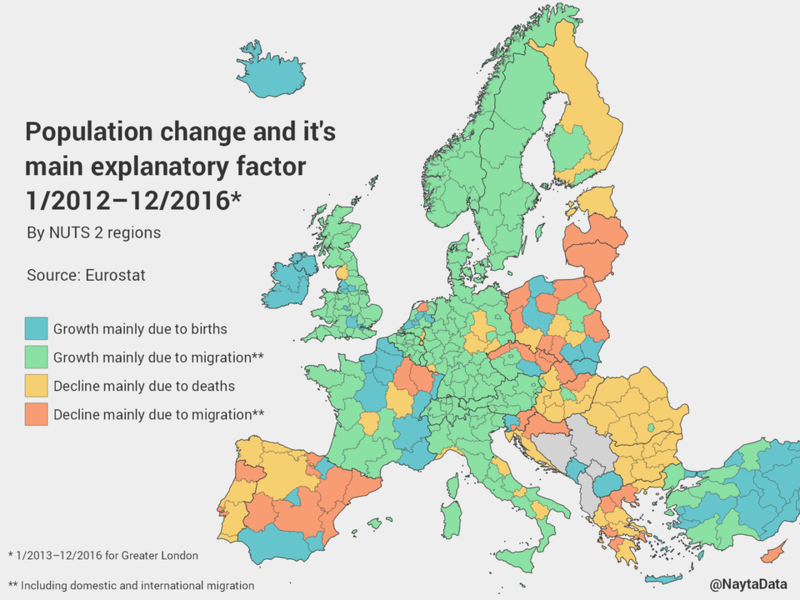 However, because not a single region of the aforementioned countries (except Latvia and Lithuania which consist of only one region), is seeing population declines primarily due to migration out of the region, it is reasonable to assume that international migration is the primary factor driving population growth in every single growing region of every aforementioned country, not domestic migration. On the other hand, large portions of Eastern Europe are witnessing population declines due to a combination of emigration and deaths. Meanwhile, Ireland and select regions of France, Spain, the UK, Greece, Poland, and the Czech Republic are seeing population growth as a result of local births. While immigration rates are lower than at their peak in 2015, Europe remains in the midst of the largest influx of immigration since at least the Second World War. To see a visualization of the flow of immigration into Europe, click here. If you would like to be updated via email when we post a new article, please click here. It’s free and we won’t send any promotional materials. If you found this article interesting, please consider sharing it.